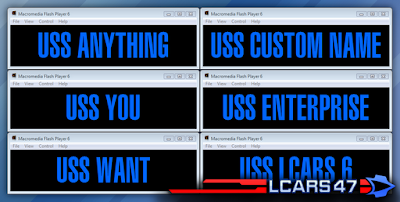 Over the course of development, I got a few requests from users asking if I could add a customized ship name to the apps. For the small "module" apps, this was no problem, since it only took an open, edit, publish and and email. But the problem with LCARS 5 (and 6) was the compilation (including quality checks) took about half an hour, so I decided not to include any reference to ship names. Well, I figured I could just include a text file and solve all those problems. I thought the text file was a better idea then an user input field, since the text will be loaded each time the app starts. So there it is, there will be a text file in the install directory, that you can edit. There is however, a character limit, although, quite generous. // would only need one. // automatically reload when you save this text file. I figured I'd make "USS Champagne" the default name, as a homage to the good old naval tradition. I forgot to mention that there's a registry number option too. 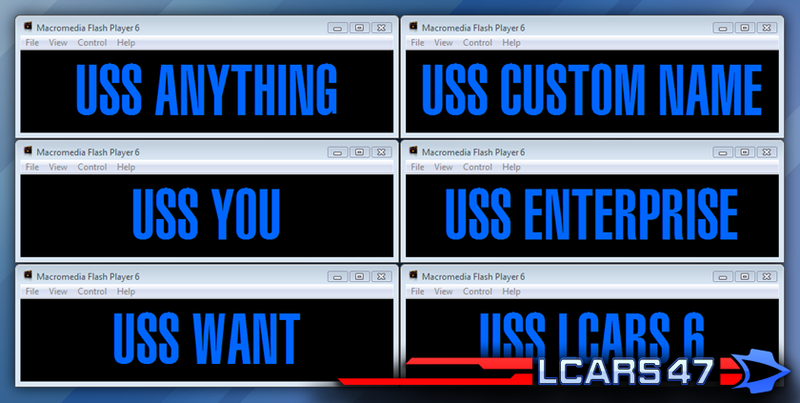 There is no (and no plans for) a ship class option, due to the variables involved in rendering MSDs in various modes.